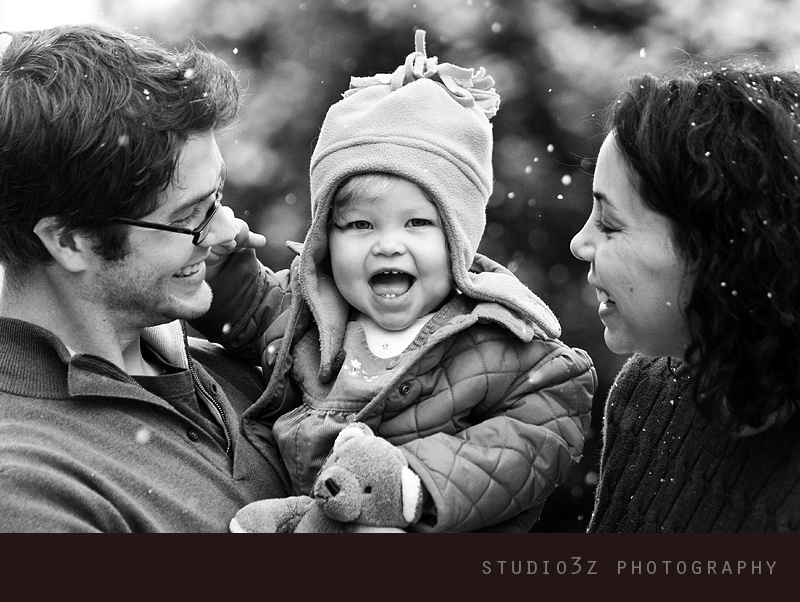 Despite the cold and the snow this sweet little family traveled from Indianapolis to Cincinnati for a family session. We were so happy and flattered that they did! 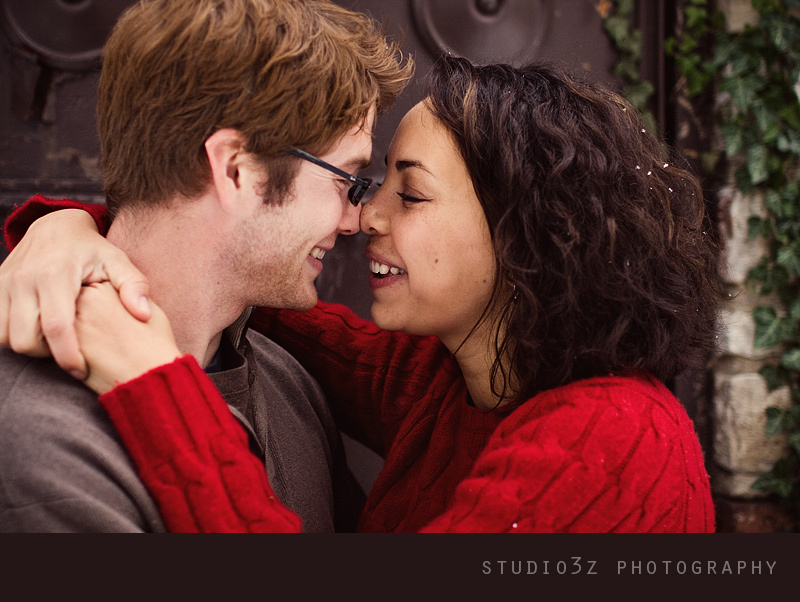 It was so wonderful that they were able to have gorgeous snow falling during their entire session. It was beautiful! 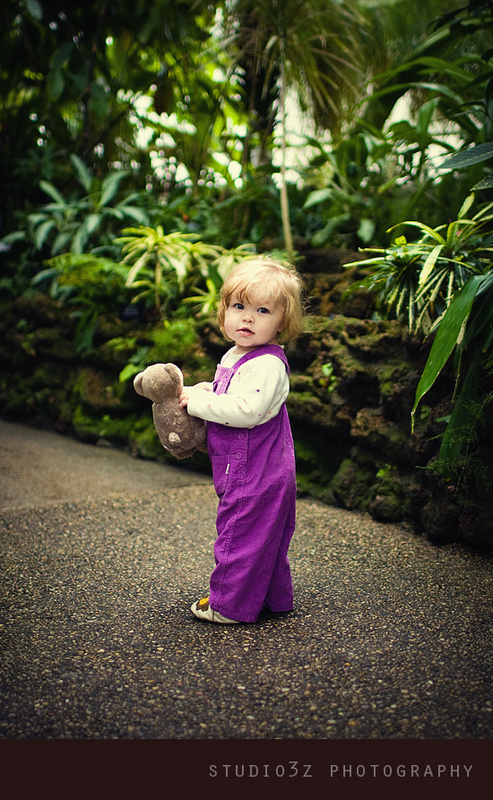 Since it was so chilly, we shot some of the session inside the Krohn’s Conservatory near downtown Cincinnati. 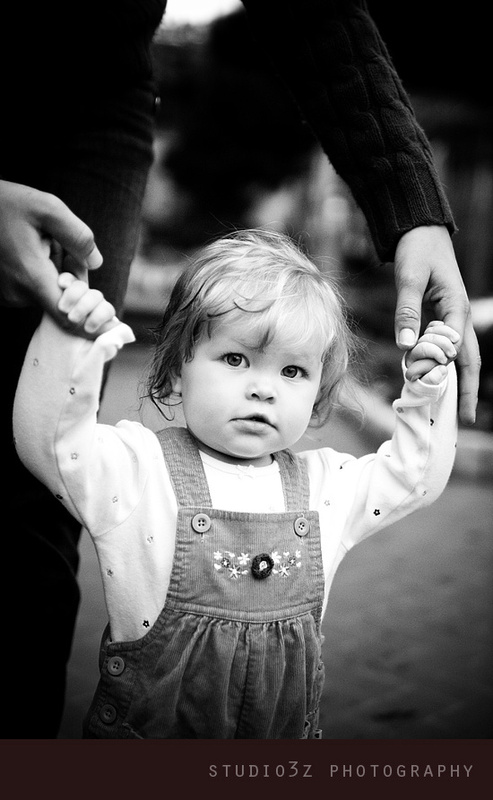 Meet little Mattea…the star of the show. We instantly loved how lovey they were with one another. Mattea just turned one, and she is so STINKIN CUTE!! I could eat her up! There was a little train going around, and she was growling at it as it went by. I love this age. 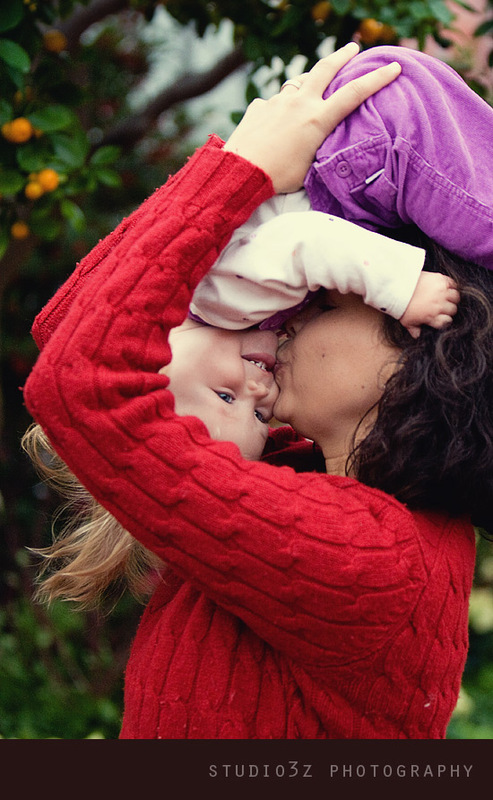 A few upside down kisses…..
And then back outside we went! I love how her little bear is in her photos. That will probably be so precious to look back on. A smile while walking with Daddy. LOVE LOVE LOVE. I think Mattea knows she is LOVED, and that is awesome. After a while Mattea was almost finished modeling…so this is her “I’m done” face. I don’t blame her, it was COLD! I took Mattea to see the ducks and Brett got some of just Jon + Sam. They are adorably in love. 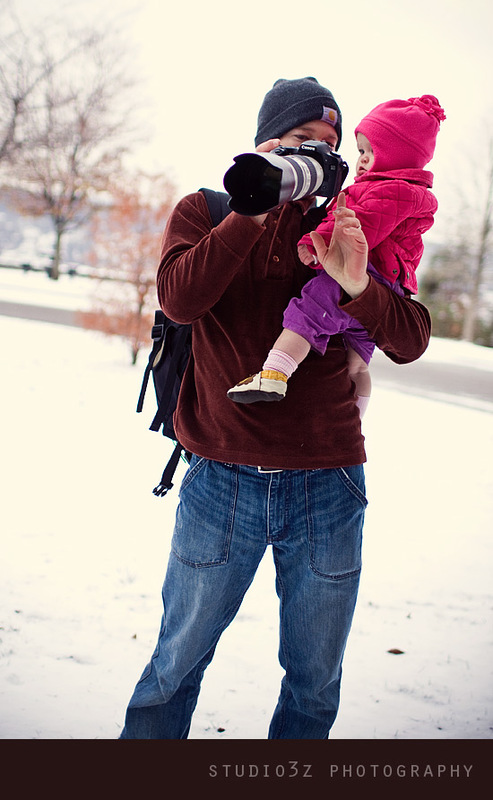 While I was taking photos of mom and dad alone, Brett was getting a few pointers from the expert. 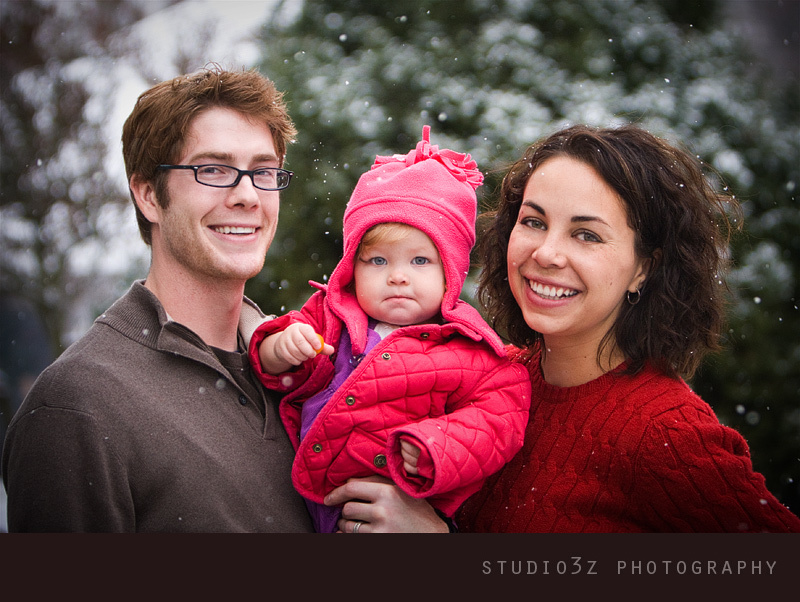 Thanks Samantha, Jonathan and Mattea for traveling to Cincy and braving the weather to have us do your session! 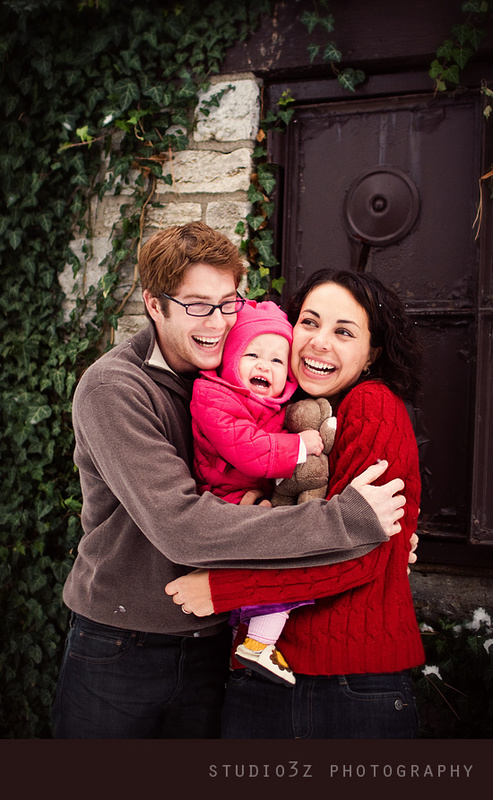 We really enjoyed getting to know you guys, and you are such an adorable little family. SamandJon - Jess & Brett. Thanks so much for making what could have been an intimidating experience so much fun! 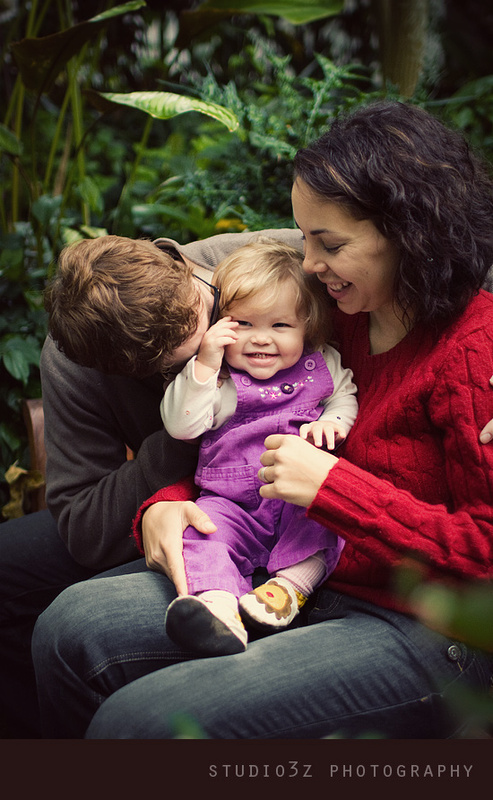 We know it isn’t easy to get great photos of two not-so-photogenic people and a baby, but we absolutely love these photos. Thanks again for spending the day with us. jess@studio3z - I beg to differ!! I think you 3 are VERY photogenic. You are a beautiful family. 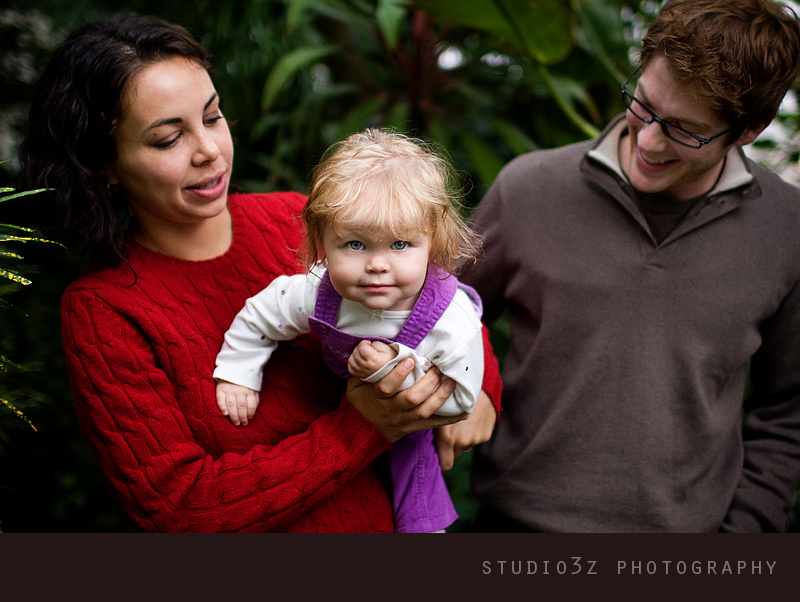 Amanda - Siding with Jess on this one–what a BEAUTIFUL family! The snow is just too perfect too. 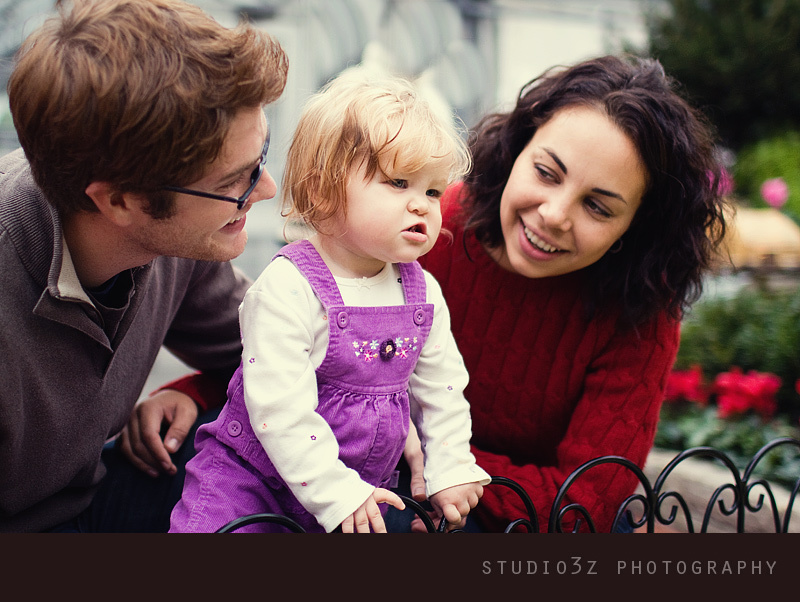 The couples shots are also very sweet; once a little one comes along, those seem to be a rarity. 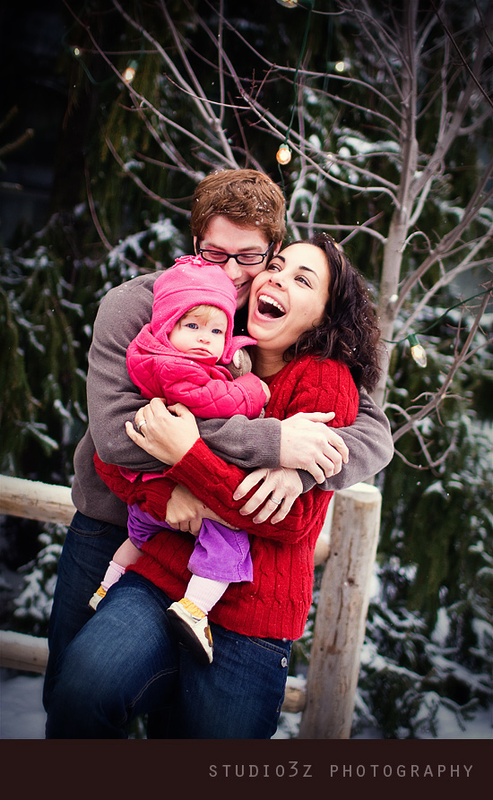 gina w - i totally ditto the last two sentiments…you are a gorgeous, gorgeous family!!!!! jess, a beautiful job and yes, the ‘hair and all’….perfetto!!! Nancy C. - WOW! What a fantastic job! 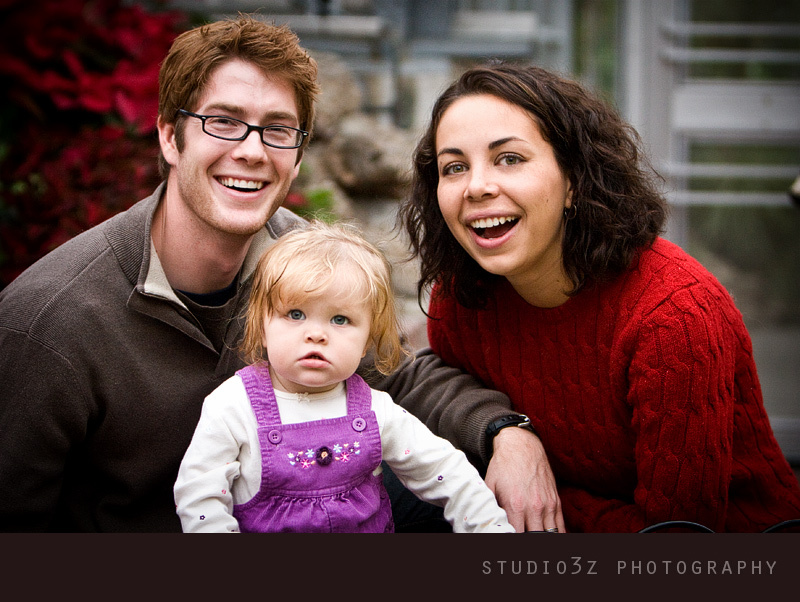 Jon, Sam and Mattea look so great! I love the use of sepia and B&W – magnificent! Barb - I just found you two tonight ~ holy smokes, I love your work! You make Cincinnati look so chic. I’d love to know where you do some of your more urban shoots. Cheers from another Cinci photographer (I do mostly commercial non-profit work, but love taking shots like you two are doing!). Alex - Love the black & whites with the snowflakes! shannon selim - wow these are awesome! 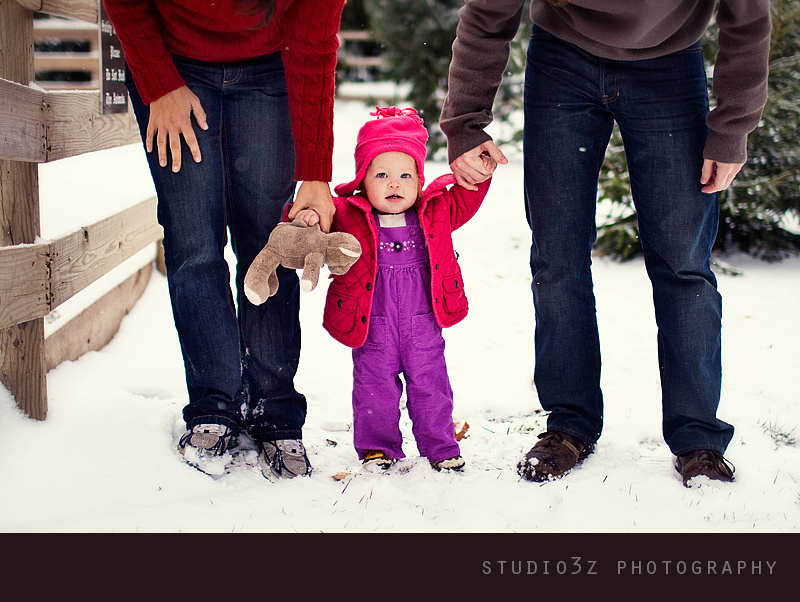 it must be nice to get shots in different seasons, though its frickin cold… its worth it! ya well hopefully i’ll get to come out there one of these days to meet you guys… unless i decide to get married before that, then you can come and do my wedding!!!! thanks for sharing your sister with me for new years… i can’t wait to see her. keep up the good work busy people and try to stay warm! Andrea - Jessica and Brent……you guys did a wonderful job, as always! You totally camptured the love they have for Mattea and the love they have for each other. I know them both well, and you capture it perfectly! And how lucky did they get with that snow!?!?!?! What a dream…..and another great job! Can’t wait to see the pictures hanging on their walls! 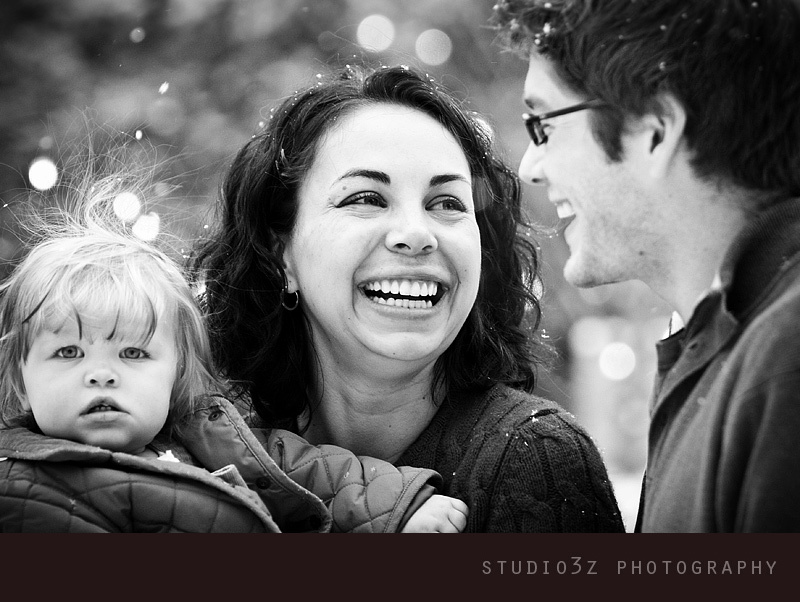 Maya - I am in love with the snow shots!! !